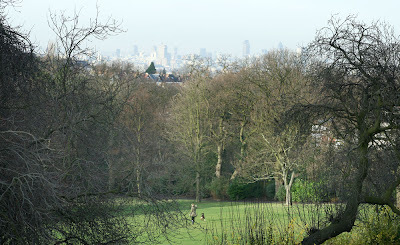 One of the highest hills around London looking back towards the centre of the city. About 15 minutes by train from central London in a south east direction, in the borough of Lewisham. Ack! I miss London! Your fresh eye on this city makes my day. Just had to letchya know. Cheers, from a spot of sun today in San Francisco! My goodness. I'm in So Cal with the rain and winter storm; you are in London with the sun! Love the spooky-knobly-inding-limbed trees. Is that Kate with her puppy? Kate Bush was bound to reel me in wasn't it.Now if you snap her I'd be beside myself. It's alovely leafy area as I recall. So nice to see such greenery. What a lovely view! Thank you! A nice photo- shows Spring is just around the corner- or is it? lol I love you interesting take on London in this blog. Ahhh... Kate Bush! Good that "Babooshka" found your post! I cant' see Kate Bush there but maybe Kate Tree! I love London! And this picture looks exactly like the way I've last seen it, two years ago. The picture is absolutly gorgeous! Your blog makes my day completly!